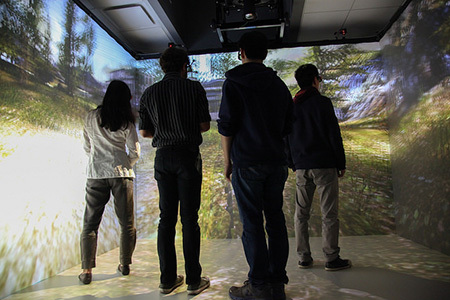 A new facility at UC Santa Cruz gives faculty and students the opportunity to create three-dimensional virtual environments that multiple users can interact with at the same time. Called the CAVE Lab, it opens up new possibilities for research and education, said Sri Kurniawan, associate professor of computational media and computer engineering. The facility features a room-sized, advanced visualization system called a Cave Automatic Virtual Environment (CAVE). It combines high-resolution, stereoscopic projection and 3-D computer graphics to create a complete sense of presence in a virtual environment. The projections cover three walls and the floor, and the CAVE allows multiple users to become fully immersed in the same virtual environment at the same time. The CAVE Lab also features moveable walls that allow the environment to be reconfigured for different applications. “This has applications for faculty in computing, game design, psychology, the arts, and a wide range of other fields. People have a lot of ideas for how they could use it,” Kurniawan said. In psychology, for example, the CAVE is a useful tool for research on human cognition and behavior, she said. The virtual environment can be used to study cognitive processing of information presented in increasingly complex environments, or to assess people with phobias by creating controlled simulations of heights or other potential triggers. The technology can also be useful for visualization of large, complex scientific datasets. Kurniawan’s own projects include health-related games currently implemented on desktop or mobile devices, such as a game for improving maternity care that simulates a maternity ward. Transferring the games to the CAVE environment would be a big undertaking, but could have many advantages. “The CAVE can make the user experience much more realistic and immersive,” she said. Kurniawan led an interdisciplinary team of faculty that won funding from the National Science Foundation (NSF), plus matching funds from campus, to buy the equipment and pay for renovation of a room in the Engineering 2 building to house the CAVE Lab. The other principal investigators on the grant are Michael Mateas and Noah Wardrip-Fruin, professors of computational media; Warren Sack, professor of film and digital media; and Steven Whittaker, professor of psychology. Wardrip-Fruin, who has used similar facilities at other institutions, said a CAVE can transport people into an alternate reality in a way that no other technology can do. “There is a big difference between experiencing virtual reality with a head-mounted display and experiencing it in a CAVE. It’s a much more powerful experience of being present with the virtual world,” he said. The facility is a good match for some of the research projects already under way in the Baskin School of Engineering and other divisions on campus, Wardrip-Fruin said. Potential users include faculty studying human-computer interaction, computer graphics, assistive technology, language and linguistics, game design, and digital arts and new media. Arnav Jhala, an assistant professor of computational media whose research includes work on avatars with believable full-body interaction, said immersive visualization systems can significantly improve experiential learning in educational virtual environments. The CAVE Lab features Mechdyne CAVE and FLEX technology and uses the Unity development platform for creating 3-D interactive environments. In addition to the $300,000 NSF grant, matching funds for the purchase of the CAVE, as well as room renovation and graduate student support costs, were provided by the UC Santa Cruz Office of Research, the Office of the Dean of the Baskin School of Engineering, and the Departments of Computer Engineering and Computer Science. These funds do not cover ongoing expenses and staffing of the facility, which will operate on a pay-for-use model.